Safco Height Adjustable Split-Level Drafting Table - GS Direct, Inc.
Adjustable tilt workstation is perfect for drafting, tilting to a 50 degree horizontal. Attached adjustable height table tops are designed to keep your computer close at hand while offering space for supplies over head for easy access. Tri-adjustment offers the ultimate efficiency to accommodate personal working space. Allows you to truly make the most out of your working area. Tables can easily be lowered to serve as one flat working surface or raised to perform as a standing height workstation. Stop knocking items over, wasting space and moving back and forth from computer to paper. 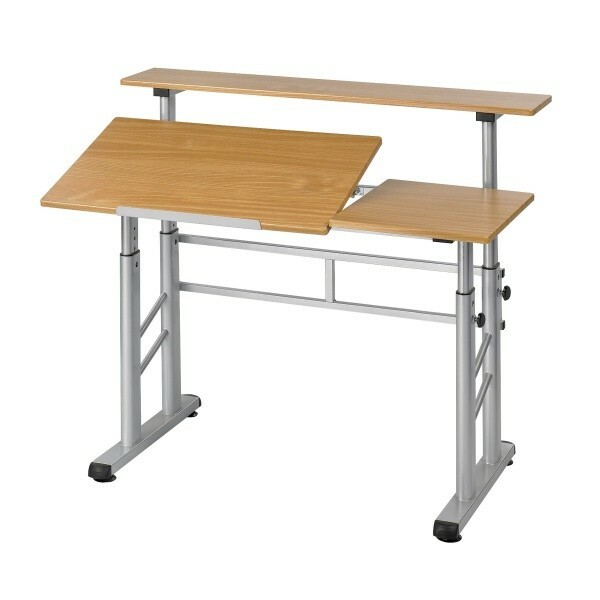 Split level workstation features a strong steel frame and woodgrain melamine top. Ideal for a variety of end-users ranging from students and architects to engineers and designers. Table has a height adjustment of 26 to 37-1/4 ". Adjustability - Height: 26" to 37 1/4"